Monterey Professional Women's Network - How to Tell if you have Dry Skin - and How to Deal with it! Depending on how much sun damage your skin has endured over the years, dry skin also may look crepey — thin, loose and papery, with surface lines. Who gets dry skin and why? According to the American Academy of Dermatology, some of the primary causes of dry skin are age and climate. People who submerge their hands and arms into water frequently as part of their job — such as doctors, nurses and hairstylists — are also prone to dry skin. So are people who swim in highly chlorinated pools. Luckily, there is a product for dry body skin in its many manifestations: NEW Rodan + Fields Active Hydration Body Replenish. Whether your symptoms are caused by genetics, age, climate or occupation, one thing you have in common with other dry-skin sufferers is that you’re probably seeking relief from how your skin feels and visible improvement in the way your skin looks. That’s where Active Hydration Body Replenish comes in. This rich-feeling body cream is both hydrating and moisturizing. (What’s the difference between the two? Find out here.) 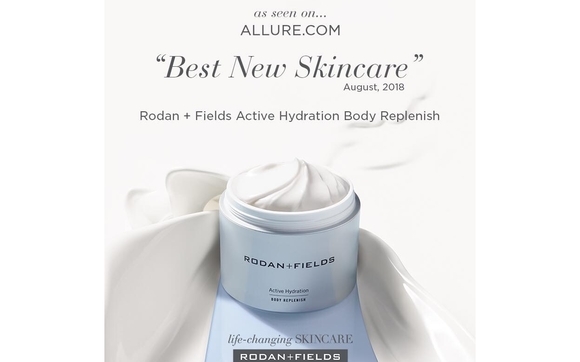 It’s powered by the patent-pending Rodan + Fields 3D3P Molecular Matrix, which draws in water from the atmosphere and holds it against your skin. After just one use, your skin will feel softer, smoother and more hydrated. And the benefits get even better over time. Used daily, Rodan + Fields Active Hydration Body Replenish leaves skin feeling more nourished. In a four-week U.S. clinical study, Active Hydration Body Replenish more than doubled skin’s hydration level in just four weeks. A full 100% of study participants saw improvement in the overall appearance of their skin, 97% saw improvement in skin radiance and 94% saw improvement in the look of crepey skin. Active Hydration Body Replenish is designed to relieve a multitude of dry-skin signs and works for all ages and skin types. So whether your skin is dry and crepey, flaky and itchy, or red and cracked, give it a try. Your body will thank you.